But is there enough power? Sony has pushed forward its 'fan-powered' announcement and brought us a new budget buddy for the pocket, which it unveiled through the magic of Facebook. The Xperia miro is a dinky device, measuring 113 x 59.4 x 9.9 mm and just 110g – with a 3.5-inch screen too. However, the resolution of the display is neither all that nor a bag of chips: the miro is coming with a HVGA screen (320 x 480), though it does have an anti-reflection coating and such. Let's not dwell on such things though, as there are a lot of features to attract those that can't / won't buy a high-end phone. Google's Android 4.0 (Ice Cream Sandwich) is on board from the outset, so you'll get access to all its fancy new features, including face unlocking and a more intuitive notifications system. There's also a 5MP camera with LED flash, and the a little blinking light below the screen to give you a nudge when there's a Facebook notification, new message or a missed call. And of course it's also got Sony's range of apps and functionality on board too: xLoud sound enhancement might not have the swagger of Beats Audio branding, but does bring an extra element to audio quality. You can also easily stream the content to a larger screen through DLNA – plus Music Unlimited is also bundled as an app (although you'll sadly have to pay for the streaming service). 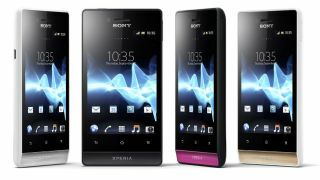 The Sony Xperia Miro release date has been set for Q3 this year in Europe - that's July to September, in case you're not up with the notion of Q's. We're awaiting the important information still: namely, the Sony Xperia miro price. If it's too expensive we can't see this phone competing with the likes of the Orange San Diego or Huawei Ascend G300, so let's hope for a cheaper price tag to go with the 800MHz processor on board.